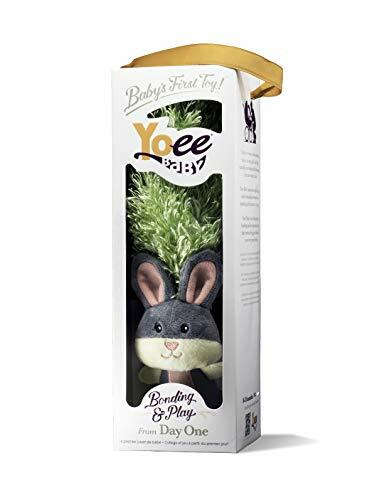 Yoee Baby Bunny is a developmental baby toy designed to engage babies in playful interactions that spark connections and stimulate bonding with baby and infant development. Inspired by the idea of caressing a baby with a feather, the feather-like tail can be used to caress babyÌs face, arms, legs, toes and belly. At a time when babies canÌt sit up, grasp or move around, Yoee Baby makes it fun and easy to play with even the tiniest of newborns. Yoee Baby is more than just a baby toy, it is a tool that naturally engages babies in the types of joyful interactions that allow them to thrive. Helps promote sensory development, body awareness, language development, gross and fine motor skills. Features include irresistibly touchable fabrics, gentle rattle and crinkles, silicone teether, high contrast colors, and playful characters. Machine washable. Makes a great new mom gift for baby Showers, baby registries, new parents, and caregivers.DEVELOPMENTAL NEWBORN BABY TOY inspired by caressing a baby with a feather. 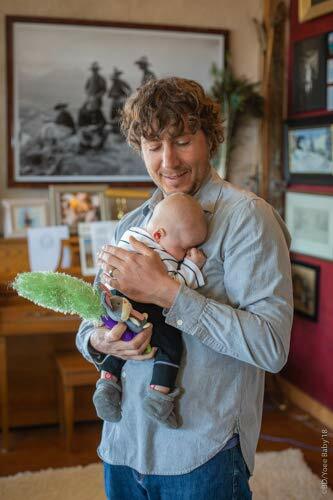 Use Yoee Baby’s, soft, feather-like tail to interact and caress your baby’s body and face, and engage all of their sensory, cognitive and physical development from day one. Ingeniously playful, easy and intuitive to use, Yoee Baby Bunny is a multi-use developmental toy designed for newborns and infants 0-3 months, 0-6 months, all the way up to 18 months old. Measures 12″ in length. INTERACT AND BOND with your newborn. Use Bunny’s soft tail to build body awareness and aid in your little one’s sensory and language development. Use the gentle rattle and crinkles for interaction to jumpstart your baby’s experience with sound. Yoee Baby’s thoughtful design encourages the types of interaction and play that promote bonding with baby. A must for baby sensory toys and interactive infant toys. Builds a good foundation for physical and baby brain development. GROWS WITH BABY – The soft handle on the back allows parents to easily use Yoee Baby in baby’s early stages to interact in a fun and safe way. Once babies can grasp, they won’t want let go of Bunny’s super soft fabrics, perfect for helping develop fine motor skills. Made with high contrast colors so you can practice object tracking and aid in eyesight development. The BPA-free, silicone teether helps to soothe the sore gums of a teething baby. THE PERFECT GIFT FOR A BABY SHOWER OR BABY REGISTRY – An essential tool for new parents to immediately bond and connect and get a head start on their baby’s development and growth. Give the gift of smiles, giggles and coos to new moms and dads!